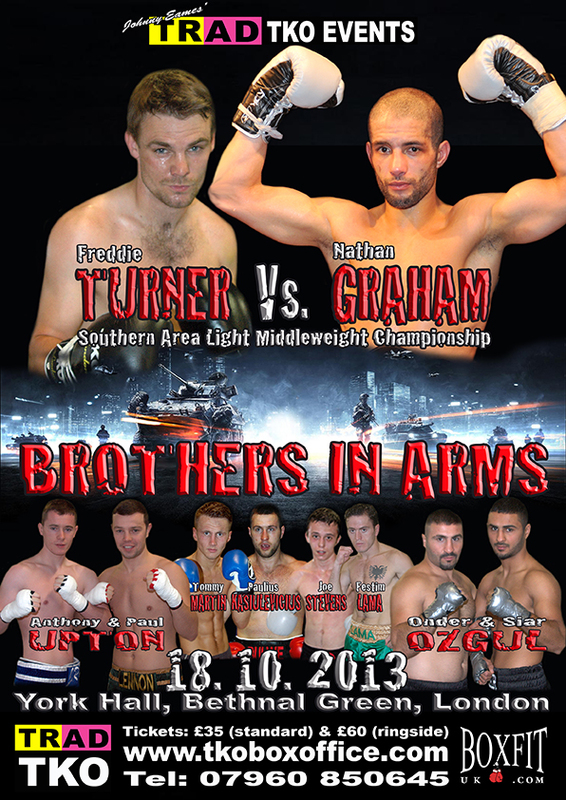 Exciting London based Albanian Middleweight prospect Festim Lama makes his third professional outing on the Johnny Eames TRAD TKO Events promoted BROTHERS IN ARMS event at York Hall on Friday 18th October 2013. 24 year Lama had a stellar amateur career, having fought over fourty fights in the UK and numerous more as a youngster in his homeland, before turning professional with renowned coach, manager and now promoter Johnny Eames, in February this year. Since turning pro Lama has wowed the York Hall faithful with two sensational, all action, performances. In his first, against Newcastle’s Didier Blanch, Lama dominated the proceedings, with his ever forward double handed attacks, ultimately stopping Blanch on the fourty four second mark of the third round. 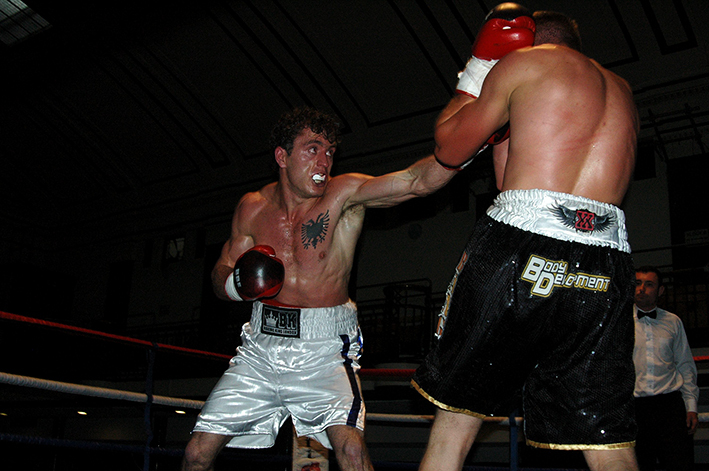 In his second bout, against Trowbridge’s Dan Blackwell, it was more of the same, although this time Blackwell proved more durable than Blanch, having survived the full twelve minutes of non-stop attack. Following a training session at the famous East End fight factory universally known as the TRAD TKO Boxing Gym, Lama spoke briefly about his upcoming bout. “I feel good, I’ve been training hard, I can’t wait to fight now, it’s been three or four months now since I last had a fight. The first one I stopped him in the third round and the second one I won it in points, that was a good fight and now I got this fight. I’m aggressive, that’s my style really, I go forward, take them to war you know, that’s the way I fight. It’s a hundred percent I will win the fight, I’m ready for war on October 18th. We’ll see where we go you know, this will be another four rounder, then maybe we step up to six rounds next fight, that’s what I’m looking for. I have a lot of support this time, lots of Albanians are coming to support me and any Albanians that know me are welcome to come and support me, that’ll be good. Festim Lama, against a yet to be named opponent, features on the undercard of the Nathan Graham versus Freddie Turner Southern Area Light Middleweight Title clash, that headlines the Johnny Eames TRAD TKO Events promoted ‘Brothers In Arms’ event at York Hall in Bethnal Green, London on Friday 18th October 2013.